Description: Several licenced Fisher-Price books were made featuring Little People Characters. The "Little People and the Big Fib" is a square soft cover book with brightly colored realistic Little People characters: Penny (green girl with blonde hair), Timmy (orange boy with brown hair), Baby (Baby figure with Bonnet), and Mom (Blue mom with blonde hair). Penny, Timmy, and Baby ruin Mom's new pillow, then tell an elaborate fib to try to explain how it was destroyed. Read the book to see how it ends. FPT5190 - Soft cover book with a white cover that has a picture of Penny, Timmy, and Baby sitting on a pink blanket. The top of the book has a red Fisher-Price awning bar and the words "The Little People and the Big Fib" in green. Published by Marvel Books, Written by Suzanne Weyn, and Illustrated by Elizabeth Miles. Measures 8" tall x 8" wide. 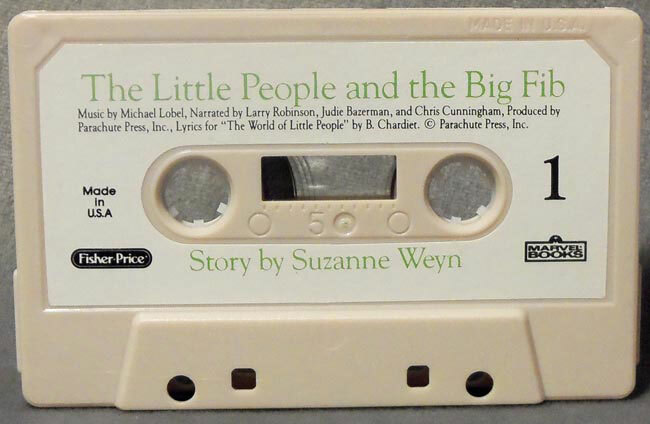 FPT22174 - Light pink cassette tape with a white label called "The Little People and the Big Fib".